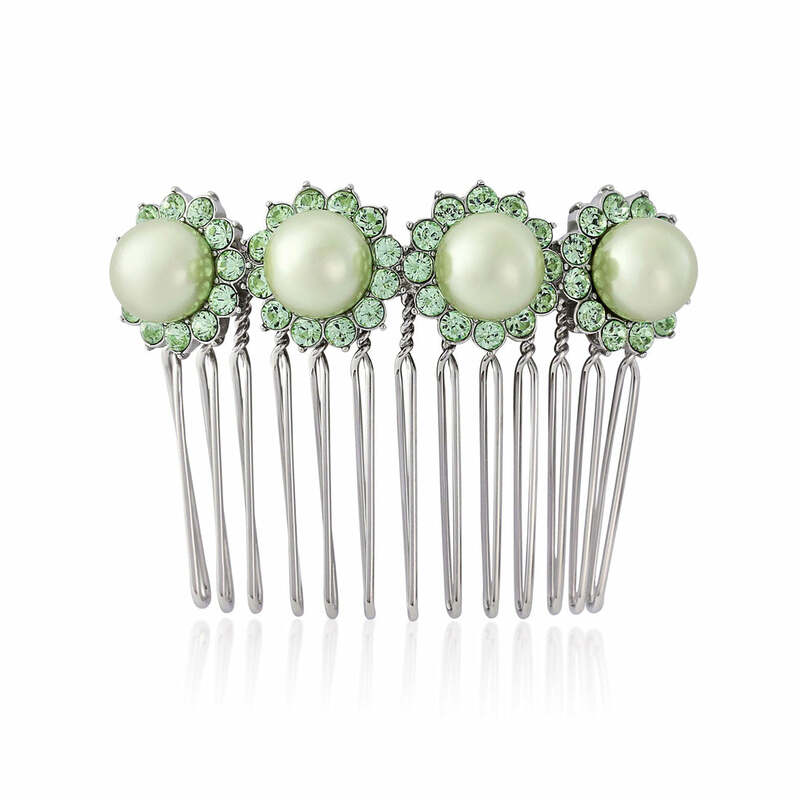 The prettiest pale green pearls & crystals give this darling hair comb a subtle hint of 1950s retro style. Prepare to swoon over the delightful soft green tones adorning our Perfect Pistachio Hair Comb! Featuring four palest green pearls encircled with coordinating Austrian crystals, you would be forgiven for thinking this pretty silver tone comb was an original retro hair accessory from the 1950s. With an abundance of vintage style, this is perfect if you adore the charm of light green hair accessories with a timeless design. Nestled in a tousled chignon, a sophisticated French pleat or half-up hairstyle, Perfect Pistachio bejewels with the perfect measure of chic femininity. A beautiful bridesmaid hair comb to enhance a pretty pastel or green wedding theme, its fresh spring-like hues make this the perfect accessory for an outdoor reception. Coordinate with our matching jewellery collection and finish with a hand-tied posy with cascades of palest green ribbons for gorgeous bridal party style.